Since 1987, Weatherflow has installed, operated, and maintained over 400 weather stations of multiple designs, types, and configurations. Many of our original stations are still on line – due in large part to Weatherflow’s extensive experience in station design and installation. Our engineers begin with the highest quality observing equipment, obtained from the top manufacturers in the U.S. and across the globe and picked specifically for its ability to perform in the harsh coastal environment. We then customize the equipment as required to optimize its performance – maximizing durability, reducing power consumption, improving data collection capability, and ensuring efficient communications with the Weatherflow network. 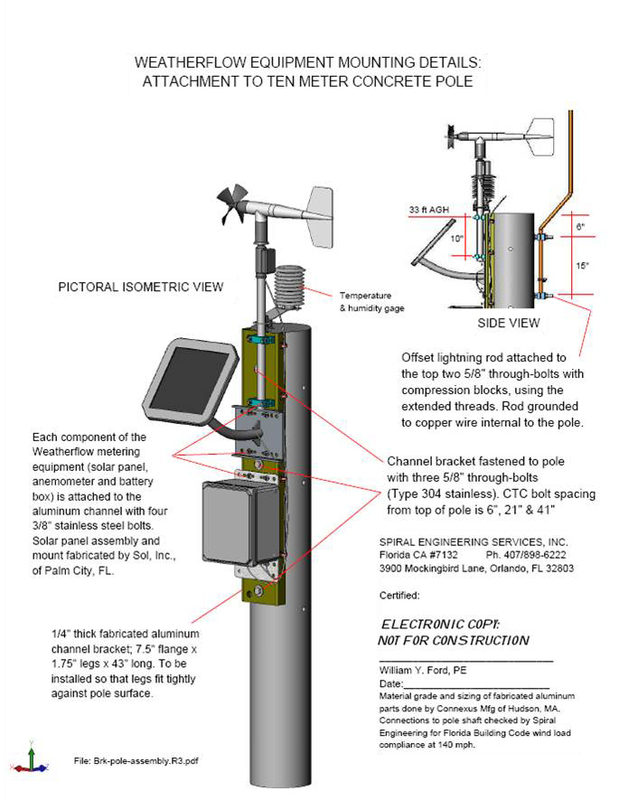 All of WeatherFlow’s stations have sensors to record Wind Speed, Wind Direction, Air Temperature, and Barometric Pressure. In addition to these basic parameters, custom sensors can be added to monitor relative humidity, rain amount, rain rate, visibility, sea surface temperature, surface currents, wave heights, and other user-requested parameters.